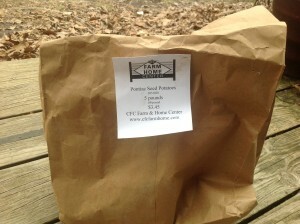 On Saturday, I purchased a bag of Pontiac red potatoes for planting. On Sunday, I planted them in my six garden bags (they are a much smaller version of this black bag). I trimmed the potatoes and tossed them in a copper/sulfur dust to heal and protect them. I bought some new dirt/compost blend for the foundation in the bags. Then I used "clean" (never used for planting) dirt from the goat compost pile to cover up. This dirt combination should hopefully give the potatoes a head start on the bugs. Unfortunately, I expect I will have to engage in chemical warfare this year due to the bags being too close to where the squash bugs are taking over the garden. That spot has the best sun, so I'm kinda stuck. I planted four cuttings per bag. The five leftover/uncut potatoes went to AmazonMink for their spring garden.